Richard Wagner (1813–1883) was a German composer, conductor and theatre director who was primarily known for his operas. The greatest musical visionary of the 19th century, or an insatiable megalomaniac who didn't know when to stop? Richard Wagner was born on May 22nd 1813 in the Jewish quarter of Leipzig. As a boy, he showed so little aptitude for music that he was the only child in his family not to receive piano lessons - he taught himself to play through Weber's Der Freischutz. At the age of 20, Wagner took a choirmaster position in Würzberg and composed his first opera, Die Feen, in 1833. His opera career soon picked up speed - he completed Rienzi in 1840, The Flying Dutchman in 1843 and Tannhauser in 1845. Wagner's most enduring work, Der Rin des Nibelungen (The Ring of the Nibelung), consists of four separate operas and took 26 years to complete. He finally reached the conclusion, Götterdämmerung, in 1876. Written in 1859, Tristan und Isolde is another example of Wagner's operatic ideal of what he called the Gesamtkunstwerk ('Complete Art-Work'). Die Meistersinger von Nürnberg from 1868 might not match The Ring Cycle for length, but it's still a hefty four-and-a-half hours long. Wagner's last completed opera was Parsifal from 1882, a typically epic work that told the story an Arthurian knight on the hunt for the holy grail. Even though Wagner's music was controversial it was not as extreme as his anti-Semitic declarations, found most famously in his article Das Judenthum in der Musik (Judaism in Music), which notoriously led directly to Hitler's passionate espousal of his music. 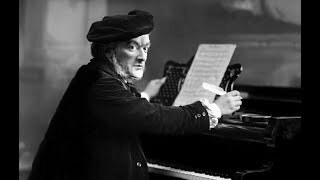 Wagner died on February 13th 1883 after suffering a heart attack on holiday in Venice. Wagner's masterpiece remains The Ring Cycle, which is made up of four different operas and takes more than fifteen hours to perform. What if Wagner had written Happy Birthday – or Verdi, Debussy or Tchaikovsky? So what was David Cameron actually humming?